Thorne emerges from his centuries of sleep, trying to find answers, trying to find his creator, trying to find some explanation for what happened in the vampire world. At first it seems lucky that he runs into Marius, ancient roman vampire who knows all the answers, but as he’s taken to Marius’s home he realises the dreadful truth… he had fallen into the hands of The Biographer Vampires and their Endless Exposition. Despite having known Marius for less than a few hours, this poor vampire is then subjected to Marius’s entire 2,000 year old life story (as an added bonus, he also tucks in the story of Eudoxia, a vampire he met along the way). I honestly think these books aren’t even trying to come up with a plausible explanation for why these vampires feel a need to info-dump their entire histories with the most purple of prose – just randomly dropping it on a stranger will do now. Thorne wanted to know about the events of Queen of the Damned, it would have taken exactly 10 minutes to sum up the (limited) plot of that book! No-one asked you your life story, Marius! To be fair, though, this is one of the better interminably long, over-detailed biographies in the series because a) Marius is a relatively relevant character and b) we get a good sense of him in this book which we haven’t seen elsewhere (unlike, say, The Vampire Armand which was repetitive and added nothing new). We get a good insight into Marius’s character as time and again he repeats the same patterns – Marius needs company. Not just vampire company (though for much of his existence he seems to need or crave a vampire companion), but human company as well especially when he was younger (relatively speaking), often throwing open his home for people to join him in parties and salons – far more so. In some ways he’s very much a product of his time and place: he’s a Roman. He’s very civilised, very social and, tellingly, pretty arrogant. Which is a wonderful repeated sense I get of Marius which is well done because I get this sense while seeing through Marius’s eyes AND without Marius himself conceding the point. But Marius is Roman, the civilised man in the world of barbarians who need to be educated. From a young age he was entrusted with the duty of keeping Akasha and Enkil safe and repeatedly drank Akasha’s blood making him much much stronger than pretty much every vampire he met. There’s a lot of fuel to that arrogance but once you see it, it puts everything else into a whole new context with Marius. Like the vampires he always has with him – he says he likes to be a teacher, but ultimately with both vampires and humans he wants to be the AUTHORITY – teacher, mentor, patron, father-figure (and lover at same time because it’s the Vampire Chronicles) up to and including his latest companion. Everyone is subservient to him, every vampire has had to look up to him or been in a weaker position than him – and any vampire who argued with him gets a completely disproportionate response from him: Pandora, Mael, when Armand defied him (and a great deal of Marius’s distrust of Armand seems to stem as much from his unwillingness to follow exactly the path Marius laid down as anything else), any vampire he has been with. He even has a completely childish snit with and Mael because they won’t take on Zenobia – who Marius has no time or inclination for; never once considering that if he didn’t want to take on a student then maybe nor did they? In turn it raises a question about why Marius wants humans around him – is it a desire for civilised company? Or is it a need for an entourage to lord it over? It also puts into context the semi-frequent disasters that blight Marius’s life – is it because he’s too close to humanity? Is it because his overarching obsession with Those Who Must be Kept distracts him? Or is because, as we see hinted at over and over, the arrogant Marius is too careless and too sure in his own abilities to take precautions? 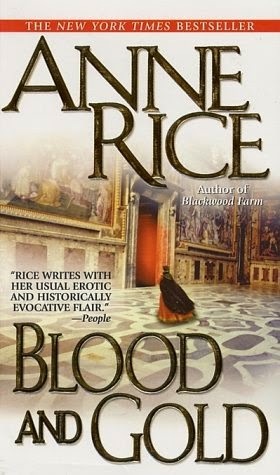 This is why, I think, Blood and Gold is much better to many of the other books – because I finished it having learned something new and quite important about one of the most important characters of the series. I ended it without feeling that it was pointless or skippable. Now, while I say it was useful and brought insight, that’s not to say it wasn’t also dreadfully dreadfully dull and more purple than Barney on acid. The overdescriptiveness of this series gets on my last nerve, the melodrama makes me laugh (at it, not with it) and, honestly, can everyone stop seeing a complete stranger and 2 seconds later declaring how much they love them. In a previous review I said that the series would have to delve into the deep history of every pizza boy who visited – well we’d also have to put up with random vampires declaring their utter adoration for the bearers of cheesey bread! And while there is original content, there’s still a huge amount of recap of previous books – Marius’s time with Armand is there in vast detail which I’ve already read in The Vampire Armand as is a chunk of Queen of the Damned and The Vampire Lestat. Thrown in on top of that is lots of history – not in a particular deep or interesting way, more like a Wikipedia recitation to provide a backdrop to Marius’s long centuries. In terms of LGBT people, Marius is bisexual and we finally have a lesser focus on the whole “bisexual men like the kiddies” theme that has saturated this series (and the Mayfair Witches). We still have Marius and Armand’s relationship but at least we dwell a little less on how much he loves his child-likeness. And it says a lot that I’m actually looking at “hey, he’s sexualising the underaged less!” as some kind of positive! We have a number of women who have the potential to be strong and interesting – Eudoxia, Pandora, Bianca, Zenobia – but inherently whenever they develop to a point where they’re not in Marius’s shadow they leave him – because of the aforementioned arrogance. But I am glad to see they do make that break from him. My end result is that I didn’t hate this book nor was it headacheworthy to read and I even finished it with a sense that something was achieved. But it also felt like work and didn’t feel fun. Damned with faint praise is the very best I can manage. It won’t hurt, it’s not terrible and if you read it before bed you will probably go to sleep nice and quickly.